What’s New In Version 14? Create and add electronic and digital signatures to your PDF documents in a matter of seconds. You no longer need to waste your time on printing, signing by hand and scanning your documents. Easily sign important PDFs directly on your desktop. With the new Sign PDF tool, you can insert electronic signatures to PDF by typing it out, drawing a signature or adding a signature image. You can even sign important PDF documents with digital (cryptographic) signatures that can be verified for authenticity. Verify the authenticity of PDF documents that have digital signatures. Able2Extract Professional 14 allows you to check whether the digital (cryptographic) signature is authentic or not by viewing the signature validation status in the document tab. Make sure that the document was signed by an authorized source, check the time of signing and establish if any modifications were made to the document after it was signed. Now, you can rest assured that the security of your business PDF documents is not compromised. Get even more control over PDF to Excel conversion with AI-powered Smart Templates. Smart Templates allow you to automatically extract relevant table data from PDF documents to Excel and CSV formats with minimal effort. You can train custom Excel templates that help Able2Extract Professional to locate and convert PDF tables that match the table structure stored in a Smart Template. 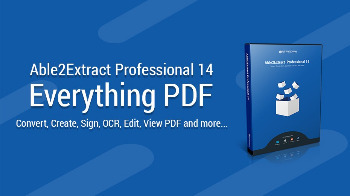 Able2Extract Professional 14 is advanced enough to accurately extract the data you need no matter the size or position of the table in your PDF document. Batch convert PDF to Excel and CSV like never before using Master Templates. Enjoy the speed of Batch conversion, and the effectiveness of Custom Templates merged into one powerful conversion feature. Thanks to the machine learning engine, you can now create distinct document categories and train a Master Template that Able2Extract Professional 14 can use to automatically match each PDF file in the batch queue to the relevant category and convert it using a category-specific conversion template. Create professional-looking PDF forms that conform to business standards using Able2Extract Professional 14. The new and improved PDF form editor gives you even more control over form fields placement. Create and position PDF form fields exactly where you want them by aligning and centering them with pinpoint precision. Now, you can make sure that your business PDF forms are perfectly formatted every single time.